Download HPSC Syllabus 2019 PDF through this article. Moreover, the higher authorities of Haryana Public Service Commission (HPSC) are planning to conduct the HCS (Ex.Br), D.S.P, E.T.O, District Food & Supplies Controller, ‘A’ Class Tehsildar, Assistant Registrar Co. Op. Societies, Assistant Excise & Taxation Officer, Block Development & Panchayat Officer, Assistant Employment Officer, Traffic Manager, District Food & Supplies Officer exam on the given date at various examination centers. In the upcoming sections of this page, we have also given you with the particulars of the hpsc.gov.in Exam Pattern 2019, Haryana PSC Selection Process 2019. Aspirants can download the hpsc.gov.in Syllabus from the link which we have provided below. So, we suggest all the aspirants to start downloading the HPSC Syllabus 2019 PDF for free of cost from this article and start the preparation. Candidates need to check each and every section of this page to get the more stuff about the HPSC Syllabus 2019. Candidates have to refer the HPSC Syllabus 2019 and begin the preparation. In case applicants who are unable to gather the syllabus, they cannot prepare well for the exam. Therefore, after completion of filling the registration process for Haryana Public Service Commission Job openings, they have to download the syllabus as early as possible. Moreover, competitors to prepare all subjects before the exam. For the sake of applicants, we provide subject wise topics at the bottom of this web page. Therefore, job seekers don’t miss this opportunity and download the syllabus. Moreover, aspirants can bookmark this article to know the latest information related to HPSC Syllabus 2019. Applicants who are searching for the HPSC Exam Syllabus 2019 this is the right place to get the syllabus and test pattern. In this article, aspirants can get the HPSC Syllabus 2019 and exam pattern for the HCS (Ex.Br), D.S.P, E.T.O, District Food & Supplies Controller, and other posts written exam. Without having any idea about the HPSC Syllabus 2019 and Exam Pattern applicants cannot prepare well for the written test. So contenders who will appear for the Haryana Public Service Commission Written Exam they must begin their exam preparation by using the below provided Haryana PSC Syllabus 2019. Without knowing the particular syllabus applicants cannot perform well in the written exam. Applicants can see the subject wise topics from the below parts of this page. See the entire page for the latest HPSC Syllabus 2019 in a straightforward manner. To start the preparation for the exam go through the whole article for the syllabus and exam pattern. To gain the good marks in the HPSC HCS, DSP, ETO, and other vacancies Written Exam 2019 all the applied candidates have to obtain the minimum marks. Contenders have to begin the preparation and get pass marks in the various positions exam. Refer the syllabus while beginning the training. By getting the correct syllabus applicants can get an idea of the subjects. To help you in preparation time we are providing the HPSC Syllabus 2019 along with Exam Pattern. Applicants can follow the provided syllabus and start the preparation. To grab this opportunity, all the applicants can easily face the written test and the further process. While preparing for the HPSC HCS, DSP, ETO, & Other vacancies exam, it is essential for every aspirant to know the required information like HPSC Syllabus 2019 and Exam Pattern. 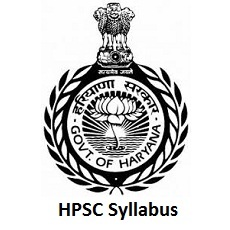 Candidates also check the more details about the HPSC Syllabus 2019 by seeing in the official web page of the Haryana Public Service Commission. According to the organization norms, aspirants will be selected based on their performance in the written exam and interview. Firstly, aspirants have to appear in the prelims and mains exam and applicants those who secure minimum cut off marks in the prelims & mains exam they will be only eligible to attend the interview. So to get recruited in this HPSC you must clear all selection rounds. So we suggest the candidates must start their exam preparation to crack the HPSC vacancy. Check our website Sarkari Recruitment, we are providing all the genuine information about the HPSC Syllabus 2019 and Exam Pattern. So follow us and Start your exam preparation to score better marks in the written test.